At the link below, the 2 red arrows indicate the 2 possible precession angles of a precessing electron. The Z axis is the axis of precession. Many quantum physicists forget that this is not the true spin axis but only the axis of precession of an electron. It is through electromagnetic interaction with all other matter that the electron is forced to precess at only these 2 precession angles for Spin UP or Spin DOWN. In Quantum theory, the axis of gyroscopic precession of an electron is considered to be its spin axis. Spin Up just means that when you measure to see which way an electron's axis of precession is oriented, it is detected to have the magnetic North of its axis of precession oriented facing magnetic South of the measuring device (aligned with). Spin Down simply means when you measure to see which way an electron's axis of precession is oriented, it is detected to have the magnetic North of its axis of precession oriented facing magnetic North of the measuring device, (aligned against). The spin Down orientation with respect to an external magnetic field is considered a higher energy state while a spin Up orientation is a lower energy state. When there is no measuring equipment involved, Spin UP and Spin DOWN simply mean that the spin axes of 2 particles are oriented in opposite directions. By convention, a "Spin Up" electron orientation relative to an external magnetic field is aligned with the external magnetic field and this is a lower energy state than when it is "Spin Down" aligned against an external field. This means that if a measuring device has its external magnetic field oriented with its North at the top and its South at the bottom then an electron's axis of precession has its North pointed down to aligned with the external field when it is in a Spin Up state. Spin UP and Spin Down do not refer to physical orientation necessarily. In other words, an external magnetic field could be oriented horizontally and an electron could be oriented horizontally to align with or against that field and still that electron is considered to be in a Spin Up or Spin Down state, depending on whether it is aligned with or against the external magnetic field. Never-the-less, when an electron is aligned against an external magnetic field, this is a higher energy state because there is potential energy stored between an external field and an electron with its axis of precession (Z axis) and associated magnetic field oriented against the external field. Work can be performed on the electron to flip its spin axis over to align with an external magnetic field either by making the external field strong enough to overcome the exchange interaction keeping it propped up against the external field or by stimulating it (with an electromagnetic signal at its frequency of precession) to flip over and align with the external field. When it moves into alignment it radiates its own electromagnetic signal (which is usually lost as heat in the magnetic material) and now it has lost the stored potential energy and is in a lower energy state. is wrong regarding no relation to the electromagnetic force. Two (paired) electrons in the same orbital are communicating electromagnetically so each knows the state of the other so that they remain in opposite states, i.e. 1 spin up and the other spin down. Many scientists get so caught up in the math that they lose sight of the real world processes that must be occurring to explain the characteristics of matter that are described by the math. The wave functions of the electrons are actually the result of their electromagnetic interaction with each other and with the sea of electromagnetic standing waves among all matter. They can�t remain in opposite states (so as to satisfy the Pauli Exclusion Principle) unless they always know each others� state through continuous electromagnetic interaction. Each electron has both spin and gyroscopic precession. The gyroscopic precession causes each electron to radiate electromagnetic waves that apply forces on the other keeping its spin orientation opposite of the other. These exchanged electromagnetic waves are synchronized with the sea of standing waves among all electrons that are also radiating and absorbing due to their precessional motions. 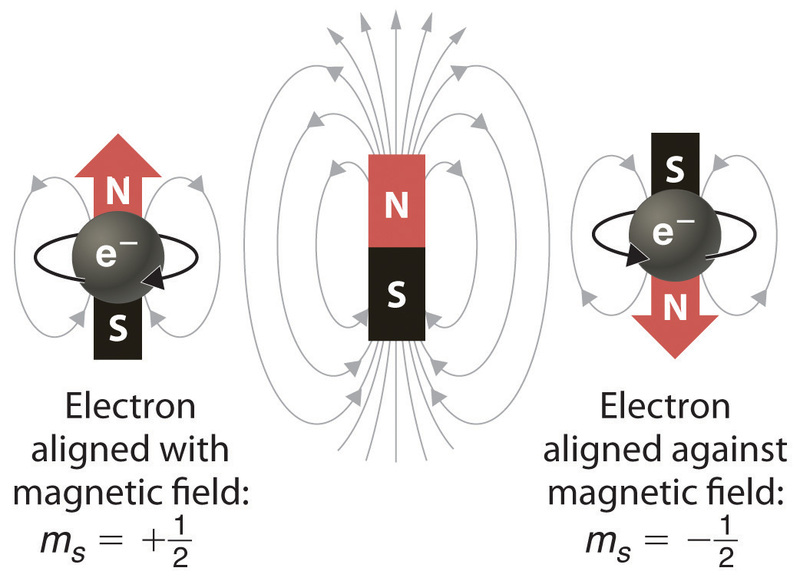 Paired electrons each have a magnetic field through their respective spin axes. A portion of this magnetic field is aligned along each electron's "Z axis" and a portion of the magnetic field continuously precesses about the electron's "Z axis". The path of magnetic flux lines tends to be from the magnetic North of 1 electron to the magnetic South of the other. The effect of this is that no net magnetic field is detectable from an electron pair outside the atom containing the pair. The magnetic field of each electron of a pair is said to be compensated by the magnetic field of the other electron. An unpaired electron in an orbital of an atom also has a magnetic field through its axis of precession but since its magnetic field is not compensated by another electron with opposite spin axis orientation its magnetic field extends beyond the atom and interacts with the magnetic fields of unpaired electrons of neighboring atoms. In some magnetic materials, like iron, an electron can be shared between atoms such that it is unpaired so its magnetic field is uncompensated and so its magnetic field can interact with the magnetic fields of neighboring unpaired electrons and with external magnetic fields. In other magnetic materials an electron can be paired but also shared between atoms in such a way as to tilt its axis of precession (canted) so that its spin is not completely compensated by its �paired� electron. The uncompensated portion of its magnetic field will interact with other partially uncompensated electrons of neighboring atoms. Actually, there are many ways that particular electron spins can be only partially compensated depending on the molecular structure and this gives rise to magnetic properties in a material. All electrons naturally tend to align with an external magnetic field when free to do so but, when there is electromagnetic interaction between paired electrons then the pair is not susceptible to outside magnetic fields. Also, for uncompensated electrons, when there is electromagnetic interaction among neighboring uncompensated electrons, this interaction applies electromagnetic forces that can keep electrons facing against an external field. This electromagnetic interaction comes partially from Coulomb forces but mainly from electromagnetic energy radiated and absorbed due to the precessions of the electrons' magnetic dipoles. This interaction is call Exchange Interaction and Super Exchange Interaction. Quantum physicists call Exchange Interaction an entirely quantum mechanical effect but this is not true, only they fail to recognize the classical electrodynamic nature of these interactions. When electrons precess, they radiate and absorb electromagnetic energy from their magnetic dipoles' sweeping around through space. This energy when absorbed by an electron can apply more force keeping it "propped up" against an external magnetic field than an external magnetic field can apply to make it flip over and align with the external field. The Einstein, Podolsky and Rosen (EPR) paradox goes away after realizing that particles are in a particular state even before we attempt to measure that state. However, the act of measuring does affect that state. For example, when analyzing an electron and positron that initially have spin 1/2 and -1/2 with respect to each other, the electron can have any random orientation of its spin axis and when you measure it, it will precess about the applied external magnetic field of the measuring device. This causes the �Z axis� to be exactly aligned with or against the external field since the �Z axis� is actually the axis of precession. The orientation of its axis of precession will always be allied exactly with or against the applied external magnetic field since the electron will naturally start precessing around the direction of an external magnetic field. Then if you measure the orientation of its previously entangled positron you will find that it also precesses about the external magnetic field of a measuring device and its axis of precession will be the opposite orientation of the electron solely because its previously random orientation was already exactly opposite that of the electron it was entangled with before.